Will miracles never cease? 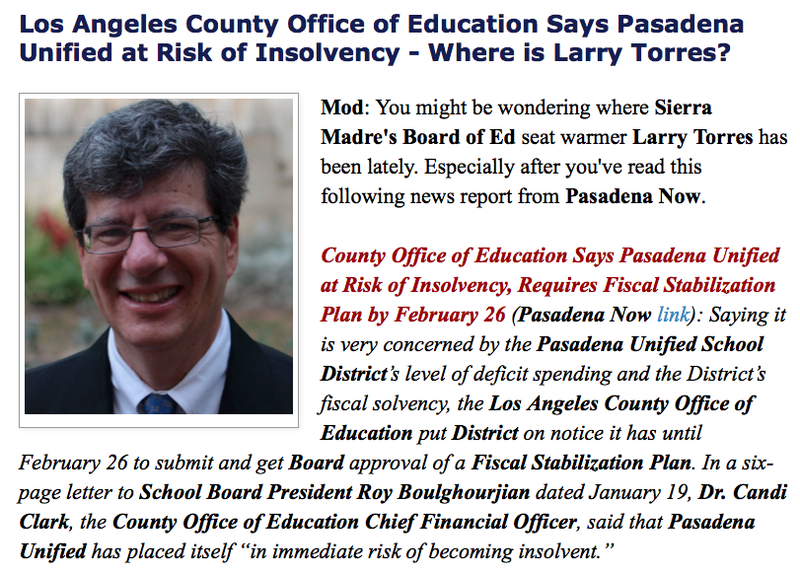 Way back on February 5th The Tattler reported that the Pasadena Unified School District was on the verge of insolvency, and that unless something was done quickly the school district that includes both of Sierra Madre's public schools could soon be taken over by Los Angeles County. Now it is a full three weeks later, and guess what? Sierra Madre's Board of Education representative Larry Torres is going to address the City Council Tuesday evening about, you guessed it, the real possibility of PUSD slipping into insolvency. Suddenly the concepts of government transparency and timely proactive response have taken on an entirely new meaning. Of course, this talk from Mr. Torres is listed as a presentation only, which I believe means there will not be much of an opportunity for any Q&A from the public. Hopefully the City Council will want to fill that gap and jump in with a few questions. Otherwise this experience will not be quite so rich. In case you haven't seen it yet, below is a financial report card on the PUSD's parlous financial condition (link). This comes to us from the Los Angeles County Office of Education, the organization that oversees the PUSD and actually has the power to take the whole thing over and remove any administrator it sees fit. So how is that going to be done? Here is how the Pasadena Star News describes it. Pasadena Unified to cut teachers, security guards, assistant principals and more due to budget woes (2.12.18 - Pasadena Star News link): Facing a large financial shortfall and under the gun from county officials, the Pasadena Unified school board voted 5-1 on Thursday to make significant budget cuts. I wonder why Larry couldn't make that meeting? Seems like it was a momentous one. Sierra Madre's PUSD Board of Education member Larry Torres will be hopefully be discussing all of this at the very beginning of tomorrow night's City Council meeting. Before the Consent Calendar even. Plan to be there early if you wish. You really have to wonder where they dig these windbags up. 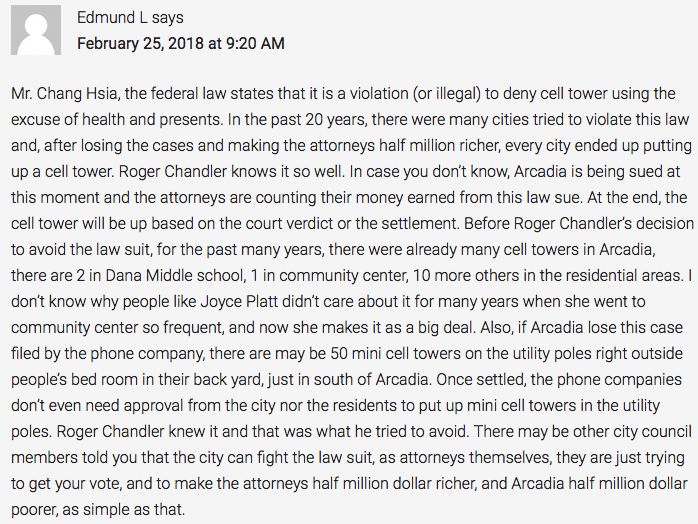 The topic is cell phone towers, and here is what one incredibly ill-informed Arcadian had to say. There is no such federal law. What the commenter is claiming here is complete nonsense. There was a proposed state law similar to what this Edmund L. character is ranting about, but it was mercifully vetoed in October of 2017 by Governor Jerry Brown. An account from The Mercury News describes how all that went down. Gov. Jerry Brown vetoes bill easing permits on cell phone towers (10.16.17 - The Mercury News link): Gov. Jerry Brown late Sunday vetoed a bill backed by the cell phone industry that would have made it easier to install microwave radiation antennas. In a signing statement, Brown wrote that while he saw the value in “extending this ​innovative technology rapidly and efficiently,” the bill took too much control away from cities and counties. Yet the bill had alarmed many local government officials around the state. They worried if SB 649 became law, it would cap how much they could charge phone companies for leases to $250 a year. Others raised concerns about the risk to public health from cell towers. The rest of the article is available at the link. What is it about Roger Chandler that he attracts the support of such poorly informed and frankly obnoxious people? I hope Edmond did not attend Arcadia schools. If so, they did a poor job of teaching him English grammar. Arrogance and ignorance are a toxic mixture. Does Edmund work for Verizon? This AB post is further proof that Chandler put's special interests above resident health and safety. Chandler also knows it's special interest groups (Verizon) that have the money to write the laws for their own self benefit. They then make large contributions to campaigns of our legislators, so that those same legislators "propose" these bills. Just google SB 649 proponent, Hueso. Before the Grammar lady has a stroke, it should be "puts" not "put's". Sorry for the typo. Chandler's campaign manager is Tommy Thai, real estate agent at Coldwell Banker/George Realty, the one owned by Tom Crosby, a self-admitted developer in Arcadia who is currently suing the City of Arcadia over a stupid driveway. Crosby is costing the City $1,000s of dollars over something so petty and not even needed. So the Tattler was right, if Chandler and Harbicht win, there will be a cell tower coming to a backyard near you! And Chandler, Harbicht and Tay will tell you they had no choice, it's the law. Arcadia: Do you want a City Council that sells you out? Vote Chandler and Harbicht. Or do you want a City Council that will fight for your safety, quality of life, health and privacy? Vote Tom Beck and Joyce Platt. The choice is in the hands of only those voters in District 2 and 5. Larry didn't show up to the Board meeting where they decided to fire all of those people because he is very tender hearted. Remember when the PUSD teachers union was loudly demonstrating for a pay raise? The Board of Ed candidates they helped to elect with their money gave them almost everything they asked for once in office. Problem is, the money wasn't there, the school system is close to insolvent, and a bunch of them are now getting fired. Its the PUSD Raise And Fire cycle..
Once again we have another large scale 'Ponzi Scheme' uncovered, of course it involved 'public tax' money and lots of it too! Why can't the public keep better track of monies spent or wasted by so call elected or appointed officials who are not responsible to the public in any shape of fashion hence we have more 'white collar' crime than we can shake a stick at? And just who picks up the tab for these foolish spend-o-holics past behavior? The Public and those tax dollar increases to cover the wasteful habits of them all. The Star News article should have written the article with more sensitive wording then "under the gun". 6:58am. Tax, tax, tax. The public elects these spend-o-holics to represent us, in hind sight we can only blame ourselves. That is how the game of politics is played in California. How do people feel about the teachers at Sierra Madre Elementary possibly packing heat? How will the Sierra Madre Police Department react? The guns might be like Kleenex. Teachers will have to pay for one themselves. The next time the teachers have a labor demonstration they'll be able to wave their guns around in the air. That should get the Board of Ed's rapt attention. I have forwarded this to the City Manager. I will post his reply here. I believe that this is what the "pedestrian study" is all about. I call BS! Transparency is not in the City Hall dictionary. Starting to have doubts about our new CM. 7:44am. Tell us what you think about the large percentage of your neighbors packing heat? 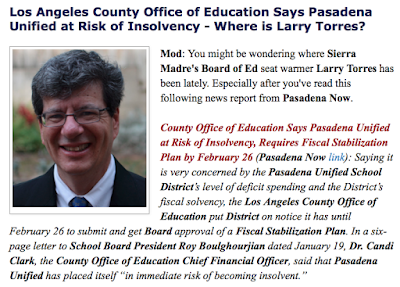 Where is Bart Doyle in all this insolvency at PUSD? There is a bond element somewhere in what the Los Angeles education authority is proposing as part of their solution for PUSD. I am sure Bart is in there somewhere. Bart has NO responsibility for the PUSD mess. It's the Board that has allowed this to happen. Thank you UNIONS. I cannot in good faith vote for any of the council members that have promoted the urbanization of Kersting Court. I have been calling all of my friends and informing them of how this group insists on changing the corner stone of the town. You gotta know Benzo is for it. No they don't 8:25. Where were you at the Community Services meeting tonight? Unless your name is Barbara Leigh, I didn't see you. 8:27am. Not necessarily. What I do know is that the three council members spearheaded by Capoccia have all promoted the destruction of the town's triangle Red Car turnaround. The council members for years have refused to name this as a historical landmark. If you think the Darling house was a joke, just wait for Kersting Court. Throw these bums out of office. Bencosme, who is the chair of this commission, will be giving the presentation to turn Kersting into Starbucks Court. You think he is going to help you? He's a carpetbagger, what would he care? Let's call it Andy Land! Gee, no one has mentioned the retirement for the district. I wonder why? Did you look at the original article, which is linked in the upper left corner of this page? Or the LA County report, also linked here? It's inevitable that PUSD's budget problems spur debate over the teachers union, salaries, retirement benefits, etc. But that's too simple. And conveniently partisan. We have a large school district GOING UNDER amid evidence that its officials are blatantly withholding financial information from its oversight committee. There's a lot more going on here. Somebody's being led out in handcuffs after the dust settles and our kids are sufficiently screwed. Agree. 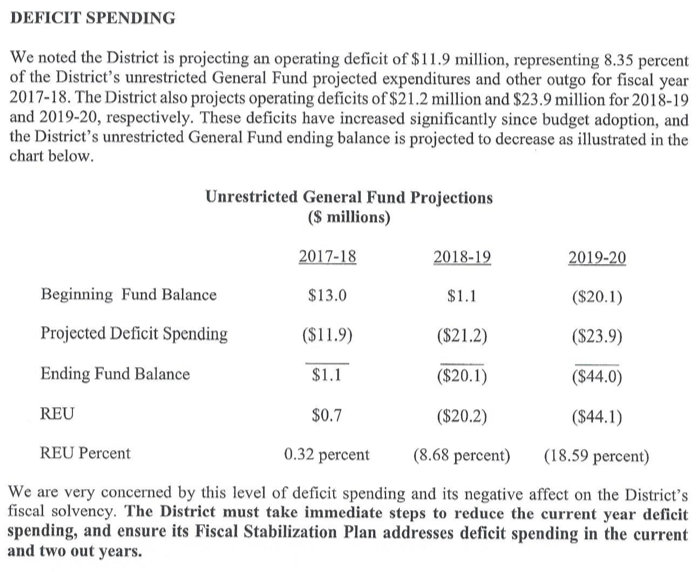 We haven't heard one plausible explanation as to how this deficit came about so quickly. We have heard that the teachers' benefits are the cause. Really? These costs are known and can be easily forecasted along with projected contract negotiation increases. Something doesn't sound right. That's spelled putts. I want excellent cell phone reception. I will vote for the supporters of updated technology. You will never have to go to a tanning booth again. Parents are too busy rushing their children off to school and social activities after school. Families lead busy lives and are too busy to take time out and attend PUSD meetings. 9:49am. Product safety warning: do not hold cell phone up to your ear, studies have shown that this may cause brain cancer. Judging by their posts Chandler voters are heavy cell phone users. Actually, what the person wrote is not total nonsense, only partial nonsense. The first sentence that you quoted correctly summarizes one portion of 47 USC 332(a), which essentially says that a city cannot stop a proposed wireless telecommunications based upon its radio frequency emissions -- unless the device emits RF in excess of federal standards. Knowing this law to be the case, telephone companies are in the habit of proposing facilities that meet federal RF requirements. Cities, can, however establish reasonable time place manner restrictions on proposed facilities. What is partial nonsense is the idea that the city has absolutely zero power to stop the installation of small cell facilities in the right of way. Cities do have some power, but it is quite limited. Under Public Utilities Code 7901 and 7901.1, cities can only use their zoning powers to establish reasonable time, place, manner restrictions on the deployment of wireless facilities in the right of way. Which doesn't mean that a city cannot prohibit them from installing on the city's own poles -- after all, that is the city's property. The city just cant stop them from installing such facilities on the telephone company's own poles (provided the poles are in reasonable locations). Not sure Jerry Brown agrees with you. Who collects the operations fees? Or are citizens double billed for upgrades located off city owned or private property? I suppose it is absorbed into he high taxes we all pay anyway. I'm not sure I know what you mean by "operation fees." Maybe you can explain When a wireless facility is installed on city property (like in a park), they pay the city rent. But when they install in the right of way, state law prohibits the city from charging rent (unless it is on the city's poles, in which case they pay rent to the city for use of the poles). When a telephone company proposes to install anything in the city, they have to get permits, and they pay permit processing fees to the city -- the fees essentially just recoup the city's costs in issuing the permit -- not a net money maker for the city. What is this about the turnaround? How have I missed all of this. Is our current council really wanting to get rid of Kersting Court or change it into anything to do with Starbucks. By the way, if Andy get into council, next time they can add more developers and we turn into a sad city like Arcadia. He should because I am right. The Tattler is correct that Governor Brown vetoed SB 649 late last year. That bill would have mandated that cities always allow small cell facilities (as defined) on the city's own infrastructure at a specified low cost. With the veto of that legislation, cities retain the power to prohibit small cell facilities on their own poles. Further, cities retain the power to establish reasonable time place manner restrictions on facilities that are in right of way. 87 teachers less means big increases in class sizes. It's extremely difficult for teachers to know students' needs individually when the class size is beyond 35, 40. Catholic school classes are frequently that large and the kids LEARN. Does Sierra Madre have the ability to become its own district or join Arcadia? The most realistic would be to take PUSD's remaining schools and fold them into the LAUSD. Close Hudson Street and put the money saved into bringing teacher salaries up to LA County standards. PUSD is obsolete. YOU must be a newbie to the area. We tried that, State said no. Who? Arcadia or the LAUSD? I would think LA would have no choice. Especially if they decide to pull the plug on the poor old thing. 12:37 - you are definitely a newbie. Been there, tried that. We were told we were racists for wanting to get out of PUSD. Bart Doyle (yes, the Bart Doyle) pointed out that white Sierra Madre kids would still be in the minority in over 50% Asian Arcadia schools. PUSD is in a death spiral. Declining enrollment leads to vacant schools which they are required by law to provide to charters which take more students away from the PUSD which lead to more vacant schools and more charters and more student loss. That and the cost of housing in Pasadena, Altadena and Sierra Madre means families with children who are middle class and below who would be users of PUSD are being driven out and replaced with higher income people who do not use the public schools. It's a death spiral for the PUSD until it reaches equilibrium which is probably 30% smaller than it currently is. Then as demographics change over the next 20 years and pasadena becomes an all-white and asian enclave the public schools will return but will never be the size it was in the past. Torrres should be advocating for individual school budgetary control that way sierra madre schools which are the best in the PUSD wont be financially robbed to subsidize schools with declining enrollment. Unfortunately, although we elect board members by District they are all not advocating for their own districts. 4-5 board members should form a coalition to force needed closures in the other 2-3 board members districts. Instead they are robbing good schools to subsidize bad schools. The PUSD is also being destroyed by legally required special ed expenditures. the pusd has vastly more than its share of special ed students and those defectives are expensive. The PUSd spends more than $100,000 a year on some of them because they are legally entitled to a "free" public education appropriate for their special needs. Does anyone agree with Jerry Brown? Ya wanna understand why California is in such a mess, how may Times has this guy been reelected? Now ya got the answ. I was so honored over the weekend to receive the mailing from Chandler for relection. All this time I’ve thought what a fool he is and the mailing hammered it home even more ! He has a photo of the new police station with the wording “The house Roger built”. What a load of BS. Really, the new police station is all his doing ? Imagine claiming that! None of the other 4 council members had anything to do with it. What an ego. He has one large picture of him as a young cop. Guess showing yourself 50 years ago is one way to try to convince people you’re not old and washed up. Good job Roger, keep the lies coming. And btw, you blew it, there’s no large photo ops with the Asians, only a small ACA group photo where they all look like they wish you’d leave them alone.